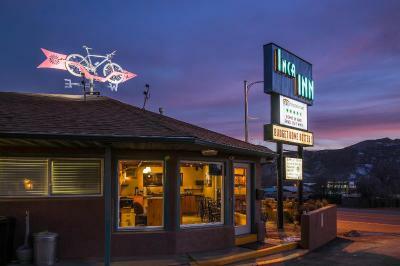 Lock in a great price for Inca Inn Motel – rated 8.8 by recent guests! Friendly, clean, simple but good breakfast included. Close enough to walk downtown. Affordable. Coffee and breakfast. 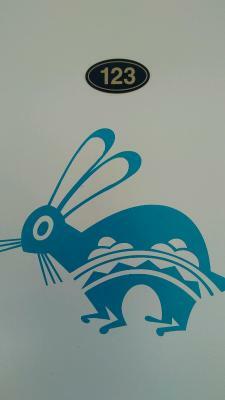 The location is great, the room was clean, and breakfast was good. The bed was comfortable and I slept well - I liked the colorful shower lights. 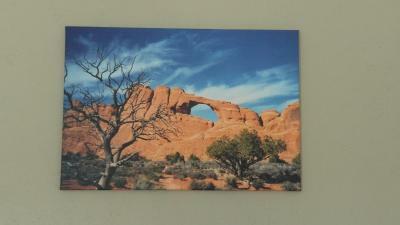 Convenient for Arches National Park. 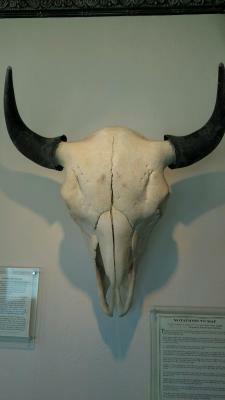 Despite a slightly shabby appearance in the bathroom I slept very well - my friend did not. Location was good right on the north edge of town. Bed was comfortable. Very friendly and helpful staff. It was in a great location. Rooms were newly remodeled and the bed was nice! The staff addressed a minor plumbing issue for us as quick as they could. Nice little breakfast as well! They're in the process of remodeling the rooms, which is nice. 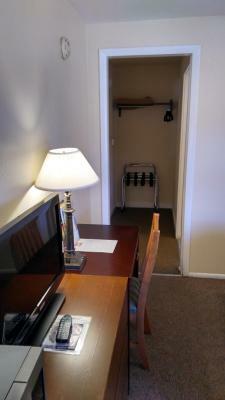 Since the motel is on the north-end of town, it's easy to get in and out of the property. Town is a quick 2 minute drive away. Very secure location too. 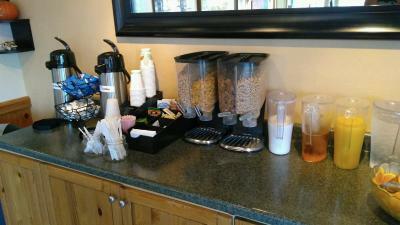 I also appreciated the breakfast options! 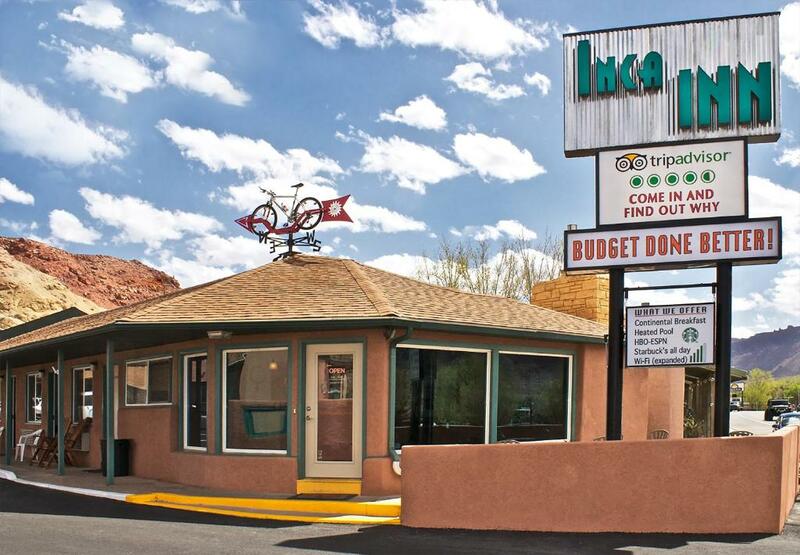 Inca Inn Motel This rating is a reflection of how the property compares to the industry standard when it comes to price, facilities and services available. It's based on a self-evaluation by the property. Use this rating to help choose your stay! 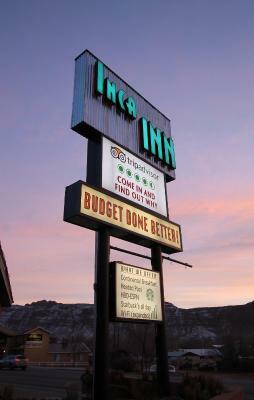 One of our top picks in Moab.The Inca Inn offers free Wi-Fi and is 2.5 miles from Arches National Park. 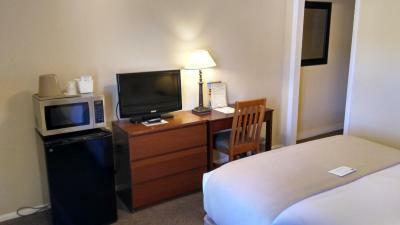 It features a heated outdoor pool and guest rooms that include a cable TV, fridge, and microwave. Every nonsmoking room at the Inca Inn Motel is air conditioned and provides free local telephone calls. Secure bicycle and luggage storage is available. 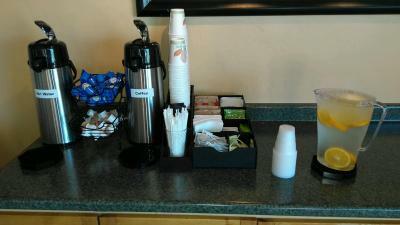 Free private parking is possible, and free continental breakfast is served daily. 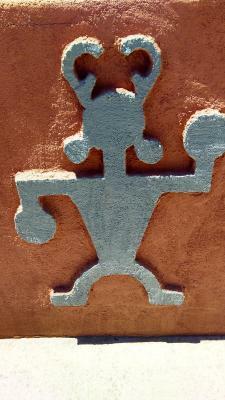 Guests are within walking distance to downtown restaurants and the La Hacienda mexican restaurant is on-site. 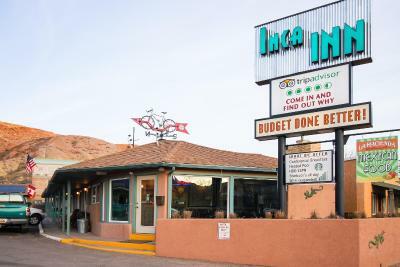 The Inca is on the North end of downtown Moab and is close to all the nearby National Parks. 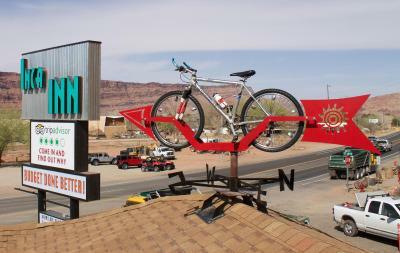 뀐 Located in the top-rated area in Moab, this property has an excellent location score of 9.2! 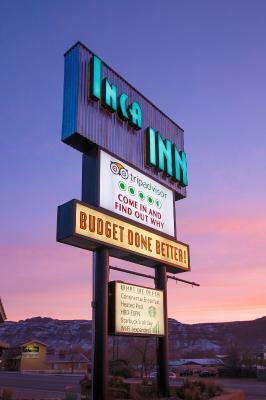 When would you like to stay at Inca Inn Motel? Provides a microwave and a refrigerator. A sitting area is also included. Please note that the price is based on 2 guests. Maximum occupancy is 2 (see Hotel Policies) . Provides a microwave and a refrigerator. Maximum occupancy is 2 (see Hotel Policies) . House Rules Inca Inn Motel takes special requests – add in the next step! Up to three children under 12 years are charged USD 9 per night when using existing beds. 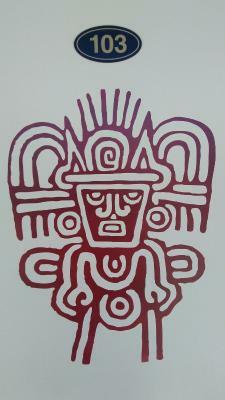 Inca Inn Motel accepts these cards and reserves the right to temporarily hold an amount prior to arrival. Only one parking space per room. No trailer parking permitted. Please note: Hairdryers and ironing facilities are available upon request. Room rates are based on 2 guests. 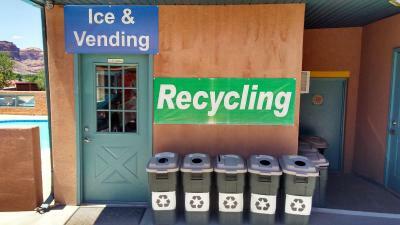 Additional fees may apply (see Hotel Policies). Remodeling occurring and there were workers in and out of rooms. Just didn't feel secure. Rooms certainly need renovation though. Breakfast was meh. Moab has several wonderful breakfast places so I'd prefer those, but sure it was okay and was included in the price. Thermostat on heater was broken, same as every hotel/motel room I've ever stayed in. 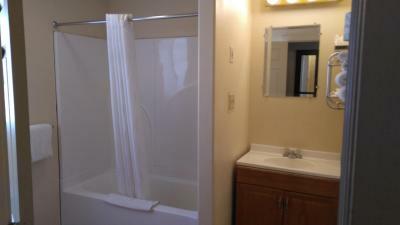 The shower is tiny and the tile in the bathroom is very slippery. Was great to be met by a very smiley lady at check in. The inn is a real bargain. Loved the breakfast (served with smiles yet again). Delicious coffee, freshly made scrambled eggs and home baked bread. Great recommendations for dinner as well. The check-in process was awkward. The receptionist was confused as I had booked 2 rooms under my name. She didn't understand why we had 2 beds in each room if there was only one person in each (that's what was on Booking.com). She wanted to move us to rooms with single beds - but not for a reduction. It turned out the TV was broken in my friend's room she said - we don't watch TV so that wasn't a problem. What was a problem was the plumbing was very poor in each room. My friend didn't like being near a road and she was afraid to turn on the taps as they were not plumbed properly into the wall. Sometimes American taps are weird for foreigners - I didn't have a problem. My shower had a gap round the edge of the pipe so you could see behind the tiles. My toilet flushed very weakly and I thought it was going to block up - by morning it had gone down and flushing it then was OK can cleared it. Room was very tight with 2 beds it was very little space to walk around it. This motel is a old travel country style with parking a front of your room. 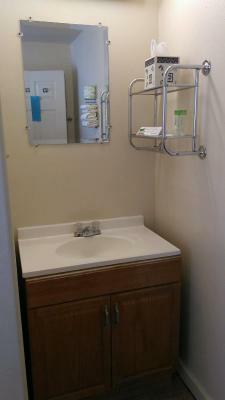 Bathroom had nice new fixtures but drainage was horrible, sink backed up to tub and tub was draining so slow that you stood in ankle deep dirty water showering. Towel holder came of the wall as I pulled towel up. Clean room, comfortable bed. Breakfast was good. 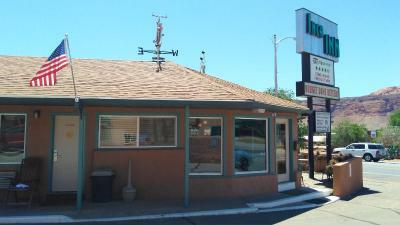 Inn is a bit run down and not worth the price charged. 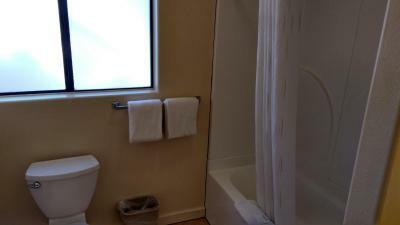 They forgot to put towels and toiletries in the room. Truck/ trailer parking was absent but we made it work.